DMEDU Launches ‘ANY LINGO KIDS’ on Jun 18th that Enables 4 Language Learning with Only Picture and Sound! ANYANG, KOREA, June 21, 2018 /24-7PressRelease/ — Infants between 3~5 years old shows explosive increase in vocabulary, and acquire about 50 new words every month in average. They speak about 900~1,000 words at 3 years old, 1,500~1,600 words in 4 years old, 2,100~2,200 words at 5 years old, and 2,600 words in 6 years old, and understands more than 20,000 words. Therefore, the language development in early child hood is an important opportunity to not miss for the rest of our lives. In response, DMEdu have launched application ‘ANI Lingo KIDS’ in last 18th that helps infants and children vocabulary extension. ‘ANI Lingo KIDS’ is a system that learns with only pictures and languages, and since the study is progressed in the situation of the text completely being excluded, it can be used from the infants and children that are in the language development situation. In particular, as it explains the word with 2~3 cuts of moving animation, it have a characteristic of freely attracting children’s interest. ‘ANI Lingo KIDS’ has a total of 515 vocabularies and moving pictures together, and the children may progress the vocabulary learning by the curriculum that is divided by 31 themes. There are five languages available, including Korean, English, Japanese, Chinese and Latin. It has the characteristic of freely attracting children’s attention. 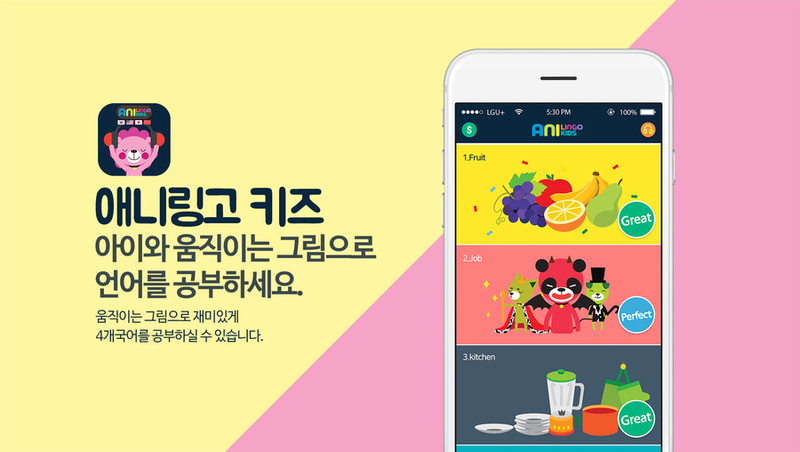 Meanwhile, the contents that were studied within the ‘ANY Lingo KIDS’ application is also provided by flash card, the children’s can progress the play learning with actual cards, and can study even writing through workbook. Flash card and workbook are sold separately.